The Chesapeake Bay is the largest estuary in the United States of America and lies off the Atlantic Ocean and is surrounded by Maryland and Virginia. The bay is around 200 miles long, has over 150 major rivers and streams running into it and covers an enormous 64,000 square-mile drainage basin or watershed from the District of Columbia and six other states: Delaware, Maryland, New York, Pennsylvania, Virginia and West Virginia. 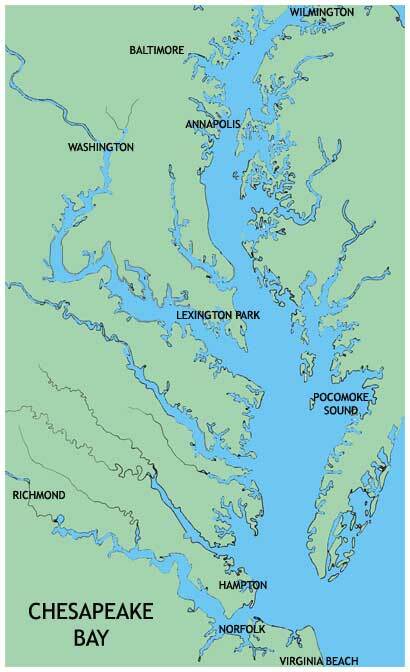 There are currently two explanations of how the Chesapeake Bay was formed. The first is that during the last Ice Age, which ended approximately 10,000 years ago, the Susquehanna River was backed up by the rising sea levels from the melting glacial ice, causing the river to flood and creating the Chesapeake Bay. The second is that the Laurentide Ice Sheet that covered Canada and a large portion of the Northern United Stated, between c. 95,000 and c.20,000 years before this present day, never reached as far south as the northernmost point of the bay and in fact the Chesapeake Bay was created 35.5 million years ago at the end of the Eocene by a Bolide, a bright meteor that explodes or strikes the earth in a fireball or meteorite. Whatever the true reason, it has left us with a fantastic 4,479 square miles of fresh and salt water sailing ground that has the most stunning scenic shorelines, perfect secluded coves, rippling rivers and picturesque creeks. The bay is full of vibrant and exuberant marine life and is home to over 170 species of shellfish and at least 350 varieties of fish, so with a beer in one hand, fishing rod in the other, relax on your yacht, be serenaded by trilling ospreys and wait for the catch of the day. With average depths of around 21 feet and over 300 anchorages you are guaranteed to find that perfect private spot where you can swim in the refreshing water and bask in the glorious sun shine. 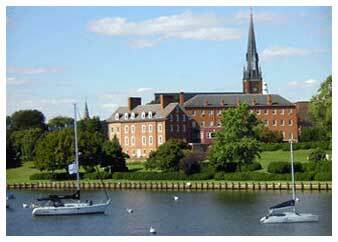 The Chesapeake Bay will have you captivated by its rich history, conservation themed attitudes and East coast charm. Hoist your sails and let the light to moderate winds cruise you through the shimmering waters to the next beautiful port, where you can drop your hook or take a slip in one of the many modern marinas. Local towns and villages are filled with traditional culture and historic colonial architecture that are hidden amongst the narrow brick streets and alleys. Wander through the bustling streets where you will find quaint antique and gift shops, museums, lively bars and unique restaurants that serve the famous blue crab as a specialty. Stroll through the secret gardens and 18th century courtyards, relax in the beautiful flowered parks or enjoy the pristine sandy beaches of Chincoteague, Tangier and the barrier islands. Throughout the year people from all over the Chesapeake Bay join together to enjoy large festivals and celebrations that normally revolve around sea food, such as the Crab and Oysters. 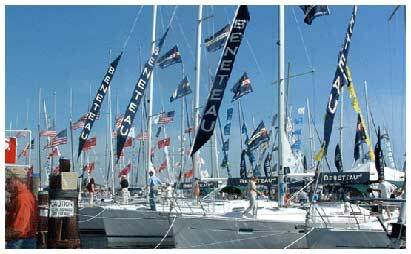 The Chesapeake Bay has a massive yachting community and hosts annual events including the Annapolis Boatshow, numerous Sailing regattas, hydroplane boat races, kayak and canoe races, food and wine festivals and the Great Chesapeake Bay Swim, to name just a few. Everyone is welcome and charterers can enjoy the fabulous food, friendly atmosphere and listen to the live bands playing traditional country songs, jazz music and blues rhythms. As you dance the night away under the stars and watch the magical fireworks displays you will be glad you chose the Chesapeake Bay as your charter destination. Beauty, serenity and peace mixed with colonial architecture, picturesque villages and lively towns are what make the Chesapeake Bay “one of the best sailing grounds in the United States”.